To make the most of this post I have added a gallery of my pictures which I hope sum up some of the atmosphere of the battle of Waterloo re-enactments of the last two days. All credit to the organisers on two fronts. They certainly went for the mood by holding the re-enactments in the evening in the natural bowl that still forms part of the historic battleground. The cannons and musket fire then filled the bowl with smoke giving the impression of various battle scenes disappearing in and out of focus as the fogs cleared occasionally or troops dashed in and out of our area of the battle. There was a lot of criticism of the first day, both in social media and in the local press because it was a bit static and all a bit far from the audience. The second organisers’ credit is that Saturday night was superb, much better mood, commentary, audience interaction and some really impressive effects. I think if I had stood in front of the French Imperial Guard as it marched down the hill I would have quaked in my boots. The evening gloom and the smoke made photography difficult on anything except a professional camera so I have concentrated on the mood and the feel of my images rather than the handful that are crisp and clear. I have also experimented with a new WordPress tool for this post – the “gallery”. If you click on one of the images below you will get a carousel of full size images which should give a much better impression than the small shots. Comments appreciated please – I would like to see how this format works. More posts “from the front line” to come! This entry was posted in Events, History, Life in Belgium, Musings, Travel and tagged Battle of Waterloo, Belgique, Belgium, History, Military history, photography, Spectacle, Waterloo by kevinmayne. Bookmark the permalink. Much appreciated, thanks for reading. Nice site by the way! I mentioned in a previous post about Waterloo that this feels quite different to the WW1 commemorations which really dealt with the dignity and folly of war issues with great sensitivity. The distance of time and the colourful uniforms make this a little more artificial but the minutes silence at the start on Saturday was thoughtful and well observed. 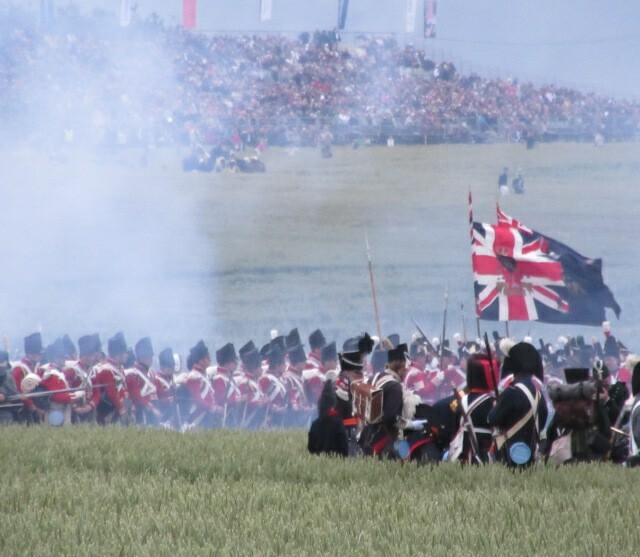 Suggested reading – some great photos of the Waterloo re-enactments. Reblogged on Windows into History. Thank you – I appreciate the reblog, especially on a history site, I feel like a humble tourist on these subject matters. Really enjoyed your use of the gallery tool. Terrific post. Thanks. It seems to have gone down well. Now I have to avoid the temptation to over-use it!